What could you be doing if you were in Italy for the Easter weekend? Travel, culture, museums, walks and great food are all on offer. Many Italians like to visit friends or take a trip over the Easter weekend. There are so many opportunities to enjoy the traditions of the local communities they travel to. The weather forecast is looking very good for the southern regions, as hot air begins to blow in from Africa. Weather forecasters are predicting temperatures in the mid-twenties and even as high as 30 °C in Sicily. Even in the northern and central regions temperatures are expected to rise, but with some rainfall. There are so many opportunities to enjoy the traditions of the local communities during Easter. If you find yourself up north on a rainy day there are still plenty of activities to enjoy. What better excuse to spend a few hours in your favourite restaurant, tasting the traditional cuisine of the region with a glass of local wine. In Italy we say, “Natale con i tuoi, Pasqua con chi vuoi”, which is basically interpreted as “Christmas with family, Easter with whomever you like”. If you are invited to have lunch at a friend’s home, you should visit the local bakery nice and early on Sunday morning to choose a selection of cakes to take with you, or even a special Easter cake in the shape of a lamb or a dove. Whichever you choose they are sure to be wrapped beautifully. The time to have a big long lunch with friends is usually Easter Monday (Pasquetta), which is a bank holiday. This might include lamb, seasonal vegetables, local pasta dishes, cheeses and cakes. 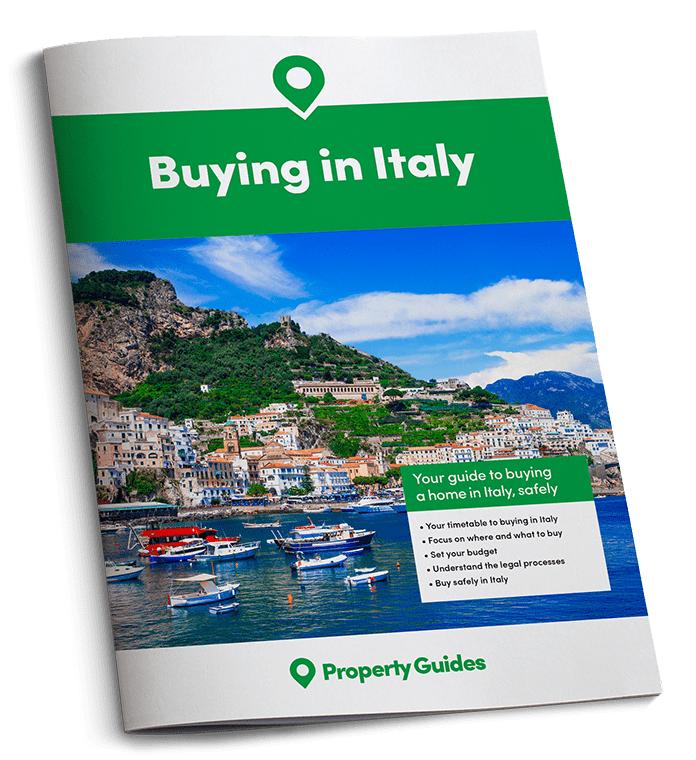 After all that food you will need to walk it off, and Italy has plenty of countryside and seaside trails which are just beginning to blossom with spring flowers. Over the weekend you may also witness people exerting themselves in other strange ways. If you are in Tuscany, Emilia-Romagna, Umbria, Abbruzo, Marche, Lazio or Campania, you might see the traditional Easter game of cheese rolling. Known in Italian as Ruzzolone, the challenge is to roll a wheel of cheese the furthest. In the Sicilian town of Terrasini the men compete against each other to see who can lift a 50kg orange tree above their heads using just one arm. If you like more relaxing past times you could visit a museum. This year Easter coincides with the first Sunday of the month, which means you can visit cultural sites for free. The Italian Ministry of Cultural Heritage began this popular initiative in 2014, which established that you don’t pay to visit monuments, museums, galleries, archaeological excavations, parks and gardens of the state on the first Sunday of each month. In 2017 alone, more than 3.5 million people took advantage of the scheme. Around 450 cultural sites will be open to the public on Easter Sunday this year. You can find a full list of museums and archaeological sites on the website of the Ministero dei beni e delle attivita culturali e del turismo (MiBAC). This year Easter coincides with the first Sunday of the month, which means you can visit cultural sites for free. Around 76% of Italy’s population consider themselves Catholic, and even those who don’t attend church regularly will watch the religious processions over the period of Holy Week (Settimana Santa). Everyone is made welcome and each community will have their own customs and ways of marking the occasion. For example, In Florence they celebrate Easter Sunday with The Scoppio del Carro, or the “Explosion of the Cart”, which dates back over 350 years. 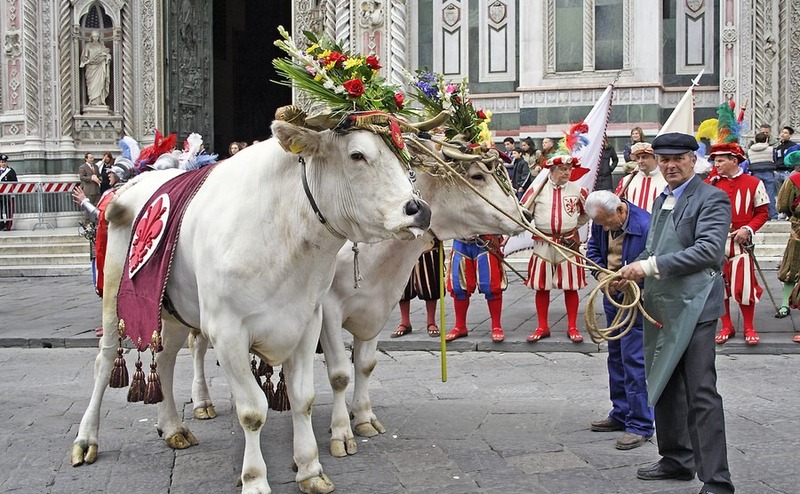 A tall and ornate wagon, built in 1622, is pulled by a pair of oxen decorated in garlands through the streets of Florence to the square between the baptistery and cathedral. Anyone who has spent time in Italy will know of the Italians love of fireworks, so it will come as no surprise that the wagon is rigged with a whole arsenal of the them, which are set off by a dove sent out on a wire from the Duomo at 11am. In many towns it is the solemn procession on the evening of good Friday (Venerdi Santo) which draws the biggest crowds. At the “Processione dei Misteri” you may see statues of Jesus carried through the town, accompanied by penitents wearing pointed hoods and dragging large crosses. In Enna on Sicily, almost two and half thousand hooded brothers walk through the town. One of the oldest and most moving processions is in Chieti, Abruzzo, as the procession is accompanied by a hundred violins and one hundred strong male voice choir. All through Holy week there are various concerts, art exhibitions and dramatic performances of the “Passion of Christ”. From the solemn Good Friday processions to the celebration of Easter Sunday (Pasqua) Italy demonstrates its emotions and culture to the full. An experience not to be missed.